Mediations - Shannin Law Firm, P.A. With over two decades of courtroom experience, Nick Shannin is happy to apply his skills as a Florida Bar Certified Mediator for both circuit court and appellate cases. 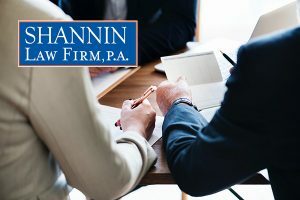 Appellate mediations: Mr. Shannin has mediated numerous cases that were pending before the Fifth District Court of Appeal, which was home of the Pilot Program for Appellate Mediation. He has also served as the mediator for cases pending before the Second District Court of Appeal. At the request of the Fifth District Court of Appeal, Mr. Shannin has participated as an instructor in that court’s appellate mediator training seminar. Circuit mediations: Mr. Shannin is well-versed in civil mediations at all levels, including Residential Mortgage Foreclosure Mediations. If you are looking for a “number shuttler” who simply takes offers from one side to another, Mr. Shannin is not your kind of mediator. If you want a mediator who will work as hard to settle your case as you have worked to prepare your case, however, Mr. Shannin might be the right mediator to help resolve your case. With an office located conveniently near Downtown Orlando, the Shannin Law Firm offers a comfortable environment for mediations. Please call for availability regarding mediation services for your case.